Triad Defense is in the News! Click here to see David Brown discuss specialized guard training for schools on KOB. For information on Private Investigations Services, please see the website for David P. Brown Investigations. Triad Defense provides expert training in the use of firearms and personal defense. 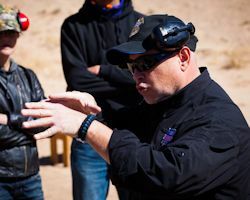 Classes are available for individuals seeking to sharpen their existing defensive skills, earn State of New Mexico Concealed Carry Certification or to become certified as a New Mexico security guard at Levels 1, 2, and 3. Training may be tailored to private individuals or provided on a corporate level. 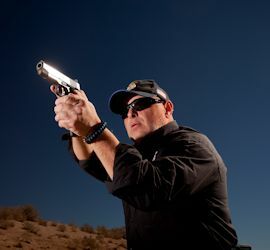 CCW and Level 2 and 3 Security Guard Certification training may be scheduled based on agency and private requirements. Please call to schedule a class. Triad Defense's primary instructor David Brown is a decorated, retired police officer and military veteran with a total of 32 years serving this country. His investigative background and experience training police as well as Probation Parole Officers to handle contentious interactions brings a unique depth to Triad's training. Triad training is fundamentally based on exposure to real world situations thereby honing decision making. Knowing when to talk is just as important as knowing what should be said. Knowing when to take physical action is just as important as knowing your physical capabilities. Knowing when to shoot is just as critical as knowing how to shoot. David Brown developed a specific system of Verbal de-escalation known as Verbal Diplomacy: Critical Communication Assessments, for the New Mexico Department of Corrections Probation and Parole. Learning this style of conflict resolution makes Triad an excellent choice for the clients interested in developing defensive skills on all levels. Instructors for Triad Defense must continually attend recertification training as well as continuing education in order to provide training certified by the NRA, Private Investigator Licensing Board, NM Criminal Investigations Division, and the NM Law Enforcement Academy, thereby placing Triad in a position to provide some of the finest, most progressive training available.